Nicholas (‘Nick’) Joseph Cercone was born in Pittsburgh PA on 18 December 1946. He earned three degrees: from the Franciscan University of Steubenville in Ohio, his Bachelor’s Degree in Engineering Science (1968); from the Ohio State University in Columbus, his Master’s Degree in Computer and Information Science (1970); and from the University of Alberta in Edmonton, his Ph.D. in Computing Science (1975), where his research focused on semantic networks as the foundation of natural language processing. His first academic appointment (1975-76) was at Old Dominion University in Norfolk, Virginia, as an Assistant Professor in Mathematics and Computer Science. The following year he returned to Canada where he spent the remainder of his career and life. His journey began at Simon Fraser University (1976-93), where he was Chair of Computing Science (1980-85), founding Director of the Centre for System Science (1987-1992), and an Associate Member of Linguistics (1988-93). He then moved east to the University of Regina (1993-97), where he was Associate Vice-President Research, Dean of Graduate Studies, and International Liaison Officer, in which role he first became seriously involved in international activities. In 1997, he journeyed further east to the University of Waterloo, where he was Chair of Computer Science (1997-2002), before moving to Dalhousie University in Halifax to be Dean of Computer Science (2002-06). Finally, he turned back west, to Toronto and to York University, to be Dean of the Faculty of Science and Engineering (2006-09) and Professor of Computer Science and Engineering (2006-2015). During this long and varied career Nick also spent a year in the Computer Science Department at the University of Victoria (1986-1987) and was a Visiting Professor in the Computer Engineering Department, King Mongkut’s Institute of Technology, Thonburi, Thailand (2001-2002). His career was distinguished not only for its obvious mobility. Research engagement and research supervision played important roles in that career, as did research leadership. He was a tireless recruiter, of faculty colleagues and graduate students (supervising over 120 graduate students and postdoctoral fellows), and of research collaborators. He was an inveterate builder of research entities, work foreshadowed in his early days in B.C. by the development of the Centre for Systems Science at S.F.U. and the Center for Advanced Systems at Regina, and culminating in the leading and building of two big networks in Toronto: the Centre for Innovation in Information Visualization and Data Driven Design (CIIVDDD) and the Big Data Research Analytics and Information Network (BRAIN), which was funded by the Ontario Centres of Excellence shortly before his death. Throughout his career of forty years he was a prolific author in refereed journals, conference proceedings and in other forms. From 1977 onwards, he held numerous research grants, totaling over $20 million, from all the major funders in Canada. He contributed huge amounts of his time to NSERC and other bodies, as a member and often the chair of various committees. He was a member of the ACM, IEEE (of which he was a Fellow), AAAI, AISB and ACL. He was a Fellow of the Canadian Artificial Intelligence Association/Association pour l’intelligence artificielle au Canada (CAIAC), which gave him a lifetime achievement award in 2015, and he also won the 2015 Canadian Association of Computer Science/Association informatique canadienne (CS-Can-Info-Can) lifetime achievement award for contributions to computer science. 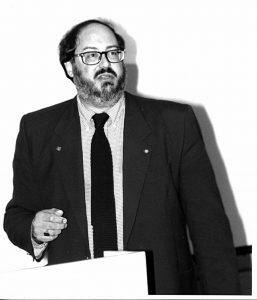 Professor Cercone was a very productive researcher in the fields of artificial intelligence (including automated natural language understanding, computational linguistics, and knowledge representation); knowledge-based systems (including knowledge discovery, data analysis and data mining); and human-machine interfaces (including natural languages and multimedia interfaces). In his last years, he became increasingly involved in the topic of Big Data, not least in exploring how such data might be used to improve the quality of health care. It is not surprising, then, that one of his final papers bears the title “What’s the Big Deal about Big Data?” (Big Data and Information Analysis 1.1  31-81). After a series of health challenges, many of them stemming from diabetes, Professor Nick Cercone died in Toronto General Hospital on December 6, 2015. He was 68.